Law enforcement officers from around the nation are at the Walker Center on the Wilkes Community College campus to pay their respects to North Carolina Highway Patrolman Samuel Bullard. 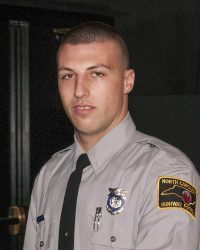 Trooper Bullard, 24, a three-year veteran assigned to Troop E, District 5 (Surry County), and a Wilkes County native, died following a chase and crash on Interstate 77 in Yadkin County on Monday night. Funeral services are set to begin at 1pm. Below is coverage as found via social media. Content will be updated throughout the afternoon.